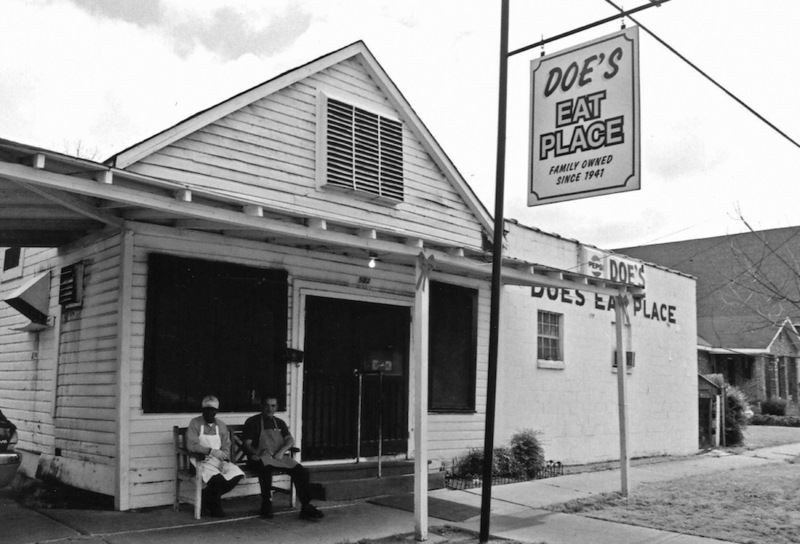 Doe’s Eat Place began in 1903 as an immigrant-owned grocery store, like many other Delta establishments. Carmel Signa sailed from Sicily, Italy, and made his way to the growing Mississippi River town of Greenville. The Signa family lived in back of what was known as Papa’s Store until the Great Mississippi Flood of 1927 destroyed their livelihood. To help the family recover, Carmel’s son, Dominic, “Big Doe,” bootlegged whiskey until he sold his still for three hundred dollars and a Model T Ford. Big Doe worked in the cafeteria at the air force base in Greenville, where one of the enlisted men gave him a recipe for hot tamales. According to food scholar John T. Edge, black farmworkers brought their lunches of cornbread and fatback into the fields, where they met migrant Mexican workers with their lunches, which also featured cornmeal and pork, though in the form of tamales. Mamie Signa, Big Doe’s wife, improved the initial recipe and began selling them from her kitchen. The tamales were popular, and soon the Signa women and children were rolling hundreds of tamales to sell to the families who showed up at Big Doe’s door seeking hot tamales for their dinner. By the mid-1940s Signa had replaced the grocery store with a juke joint, while the family still resided in the back of the building. A local doctor frequently turned up at the Signas’ back door for dinner between house calls, and Big Doe would grill him a steak to go with his tamales. Word of Doe’s delicious steaks began to spread, and the establishment developed into a unique business: a restaurant in the back for white patrons and juke joint up front for black customers. The juke joint eventually closed, and the Signa family focused on the restaurant, which became known as Doe’s Eat Place and drew customers from all over the world. During the 1950s the cast of the movie Baby Doll frequented the restaurant while filming outside of town, and director Elia Kazan ate Christmas dinner with the Signas. Two of Big Doe and Mamie’s four children, Dominic “Little Doe” and Charles, took over the restaurant in 1974, but the atmosphere remains unchanged. Doe’s Eat Place is the same clapboard and cinder block joint on Nelson Street with autographed pictures of celebrities and Mississippi sports heroes on smoke- and grease-stained walls and beer sold from an ancient cooler on the honor system that Big Doe began. Little Doe continues to wrestle giant steaks under his daddy’s old Garland broiler while patrons fight over the last hot tamale on the platter or scrape up the last bite of salad, which is still dressed and tossed in Big Doe’s wooden bowl. For a time Charles Signa operated another Doe’s in Oxford, and there are locations in Louisiana, Arkansas, Kentucky, and Oklahoma.